To prep: You only prep this game once and then you’re good for the rest of your career. Seriously. I’m going on year 12 of these number cards and they’re still going strong! On index cards (use 4×6 or larger) write two numbers, one on each side. (So the card you see with 0 on it…there’s a 1 written on the back, card 2 has the number 3 written on the back of it and so on) On the set of 5 cards, you have all numbers, 0-9. Write the entire set in the same color because the color will tell students which team they’re on. Repeat the process to make enough sets so all students can have a number. (I have 7 sets, so that’s enough for 35 kids, but if you’ve got huge classes, make 8 sets.) Write each set in a different color. Remember, each set has 5 cards, with numbers 0-9 written on them. Write these out in your target language so you’ve got them and you don’t have to think on your feet. Soon your list you write down trescientos cuatro and cincuenta y nueve mil, trescientos sestena y uno Actually move the cards around to create your list, because you have to be careful to not use a 1 and a 0 together in one number, since they’re on the same card. And you can’t the same number more than once in your combination, so don’t do 7427, for example) Write out a bunch of number combinations, some 3 digit, some 4 digit, some 5 digit. On my list I have 17 different combinations written out. That’s it, now you’re prepped for a lifetime of Number Shuffle. Pre game: Pass out the cards so that each student has one or two cards. Start with one color, the greens for example. Pass out all the green cards, then move onto the blues, then the greens until everyone has a card. It’s important that there are full sets of cards passed out, so if you pass out one card to every student and you’ve got 3 purples left over to complete the set, adjust so that a few students have 2 cards, and you’ve used up all the remaining purples. Make sure that if you give a kid 2 cards, they’re both the same color! Students look for students who have the same color card to form their teams. (So there’s a red team, a green team, etc.) Students form a large circle, standing with their teammates and the teacher stands in the middle. It’s easiest (and fastest! )(and least painful!) to do a practice round in English first so everyone gets the idea. Read off one of the numbers on your cheat sheet and student shuffle their bodies to make the number you’re reading. (If a kid has 2 cards, anyone in their team can hold the additional card). Remind them it has to be correct from your perspective (So if you said eighty five thousand, one hundred sixty three, the student to the far left should be holding the 8 and the student on the far right will have the 3). Now that grasp the idea, it’s time to start playing! 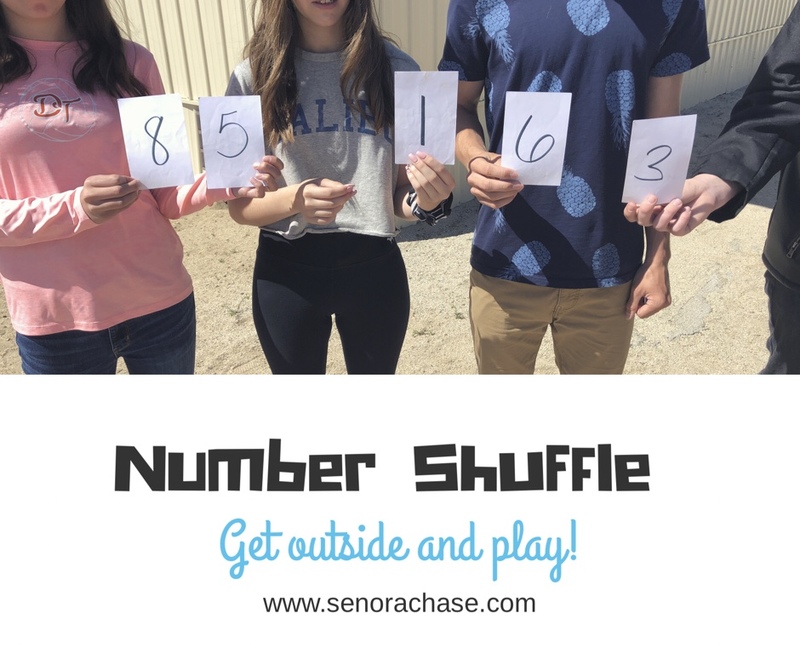 To play: Have everyone turn around facing away from the teacher (So they can’t watch the other teams shuffle) and the teacher says a number in Spanish. Say it slowly and repeat it a few times, because, remember, it’s input that counts! Then give the command, “Turn around!” and the teacher looks at all the groups to see who has the correct number displayed. One member from each correct team comes to the teacher and gets a poker chip (or anything else to indicate 1 point) and they return to their teams. Everyone turns around again (away from the teacher), teacher says a new number, students shuffle, and so on. Hey visuals learners, here’s what this game looks like. Play until you run out of time, then the winning team has the most chips. Pro tip: When you collect the cards back, it’s easiest to have all the teammates pass the card to one person in their team, who brings them to you. That way all the greens are together, all the purples are together, etc. I just fold them number sheet around it the stack of cards and put them in my game cabinet until the next time we play.